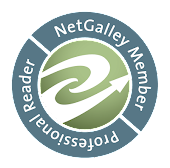 I can either thank (or blame) one person for my love of blog hops. 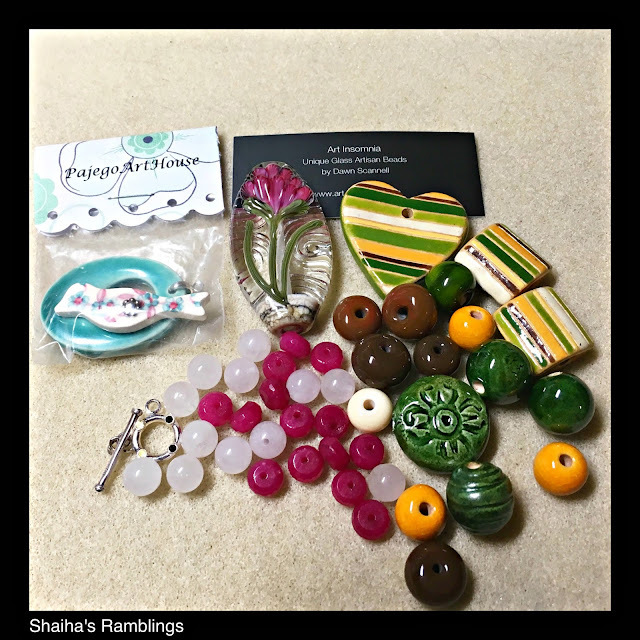 When I was first discovering Art beads, I also discovered Lori Anderson of Pretty Things. 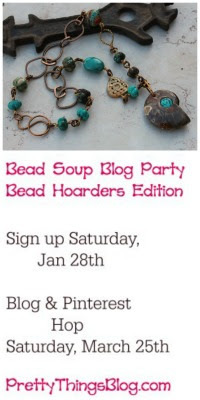 She is one of the warmest, strongest person that I know and just happened to be hosting this wonderful event called the Bead Soup Blog Party. She actually hosted quite a few and through them, I have met some friends that I keep in touch with even today. Lori has had to take some time off to deal with issues but she is back! And better then before! This time around, BSBP has a new twist. We were to pick out one bead or strand of beads that you have been hoarding. And we were to do so before we even knew who our partner was! This first necklace is all about me. I tend to dress in tunics and I adore long necklaces because I tend to fiddle with them. And the gorgeous lampwork focal has ridges! It reminds me of a worry stone. and I can see it becoming one of my favorite necklaces. And tassels! Must have tassels. I have tendency with clasps to hide them. On this necklace, I wanted the clasp to be able to demand attention. Yet it is adjustable so you could easily slide the flash of red to the front. This necklace took a bit of work. I find making beaded chains very relaxing yet my hands tend to get fussy with me especially during the winter. Now that you have looked through my designs be sure to warm up your cup of tea and check out what all these wonderful designers have come up with. There is sure to be lots of eye candy! Great job Shai. Your choice of simple chain accents lets that beautiful lampworked bead shine. I like that you can wear the second necklace two ways. I would wear your beautiful beaded chain necklace in a heartbeat. All of your pieces are great. I love the first necklace that you made for yourself. I totally hear you about the texture in the bead. My favorite necklaces are the ones that I can touch during the day. They are like stress busters. Very pretty. All three of your necklaces are beautiful I'm drawn to the last one mainly because of the green colors. I'd cheerfully wear any of these, but the top piece is just glorious! Very nice pieces - I love your feeling for soft colorcombination! What a treasure trove. Gorgeous work! The perfect balance of chain, beads, and tassels. Love love the tassels. You have made some really terrific pieces, Shaiha. I think the last one is my favorite! Each piece is lovely. I particularly like how you created two different tassels using chain. All of your pieces are beautiful! I love the birdie toggle and how it's used as the focal part of the piece. I too love long necklaces, both the lampwork necklace and the tassel necklace would look amazing with tunics! You have nothing to feel sorry about. You made 3 wonderful necklaces. I especially love the first one with beautiful rose pendant. You highlighted it wonderfully. Such beautiful pieces and I agree that clasp is far too beautiful to be hidden at the back of your neck - your design gives it much more flexibility to be shown off. Love, love, love them all!!! Yes, clearly you didn't make enough. LOL. Make more! Hope Boo is feeling better. So glad to see you enjoyed your Soup. Wow you were busy making awesome jewelry!! Well done!! You made a ton of things. I think my favorite is the green one, beautiful wraps. That floral focal necklace! I love it! Great job Shai! You got yourself a great stash there! And your finished pieces - absolutely lovely. Well done! What great use you made with your soup. I could not pick a favorite, even if my life depended on it. They all are beautiful. And yes...one must have tassels LOL. Incredible Eye Candy! I maybe be a bracelet girl... but I love these necklaces! Hope your Boo feels better... Thanks for sharing! Beautiful pieces! 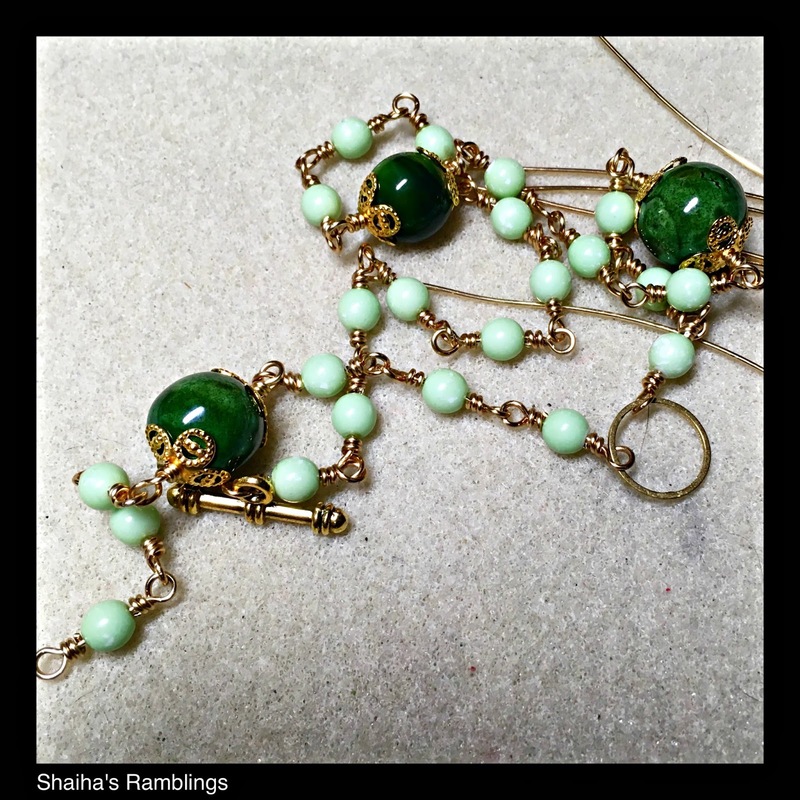 I just love chain dangles - and they are perfect to fiddle with! All are beautiful. Love how you kept it simple with that lovely glass flower focal. My favorite is the bottom green necklace with the chain tassel. Just stunning! So many lovely pieces. The soft green is so great for Spring. Love the tassel accents! Win win! 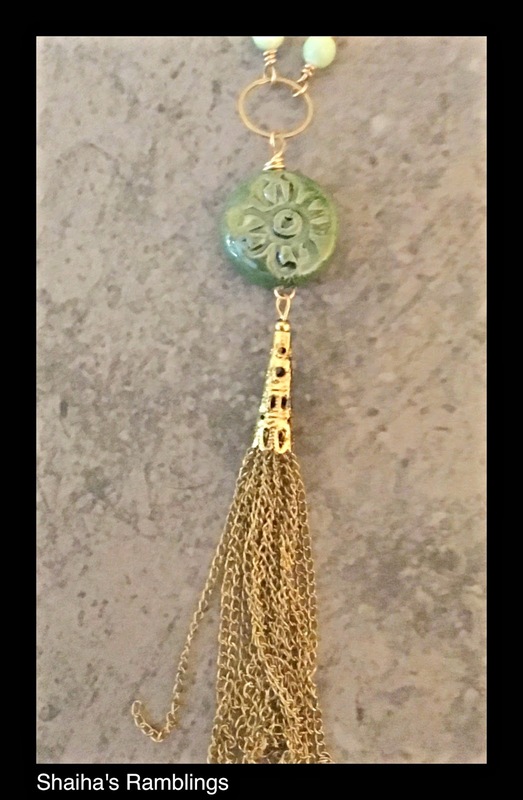 I personally love to wear tassel necklaces too so I can see and play with them! Beautiful work! I was especially inspired by the first. I have a few similar lampwork pendant sized beads that are calling to me to finish and wear! 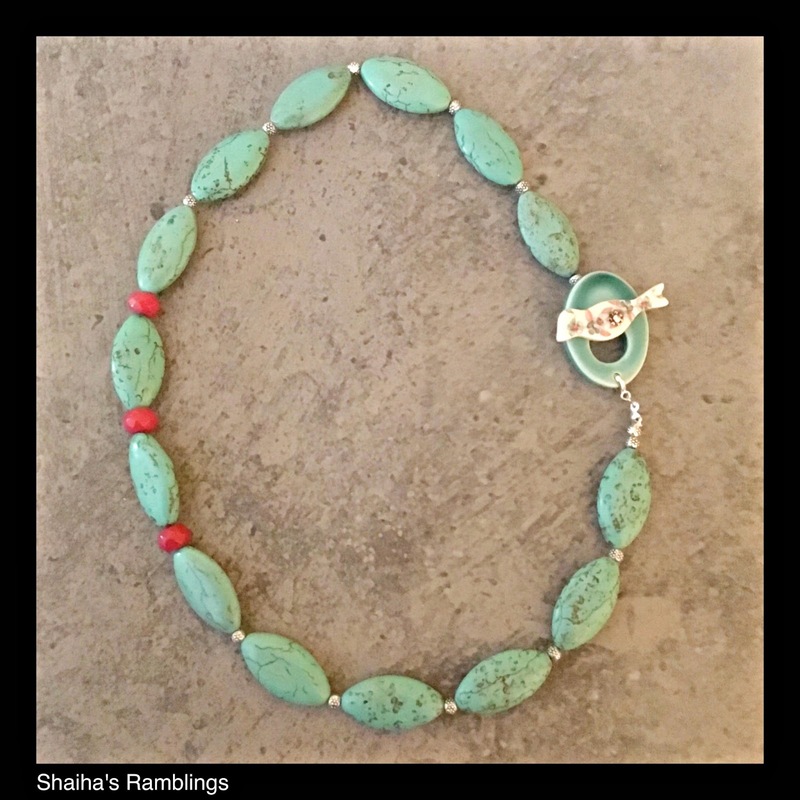 A great soup, and 3 fabulous necklaces - love 'em! Your soup makes me hungry (for more lampwork) a theme of mine. ha. I love what you did with the bird/toggle clasp in front - Yes. What a fun soup! I really enjoy all of your pieces, but that last necklace caught my eye most. 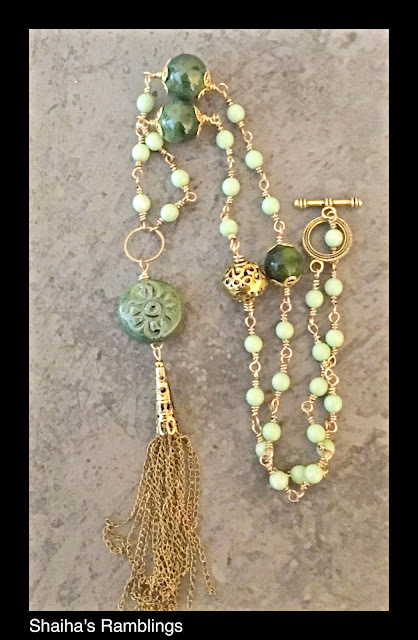 The pale green beads and your design make it appear vintage - something you'd see in a lovely shop selling all manor of delicate things. Nicely done. Beautiful - the tassels are great! What a great way to highlight the focal! Oh yes, that first necklace is so awesome. I can totally see fiddling with and rubbing on it while wearing it. Your other pieces are also very well done, but it's that floral one that gets my attention. Love the color combos and the design of necklace that brings focus to the clasp.. I love all of your pieces, especially the first one - that would be perfect to fiddle with! All very pretty! Hard to pick which one I like most! Jaw-dropping work - love that focal and how you played it up. THe first necklace is so pretty. I do like that you featured the lampwork focal without complex distractions! The bird clasp on the next necklace is adorable. I would certainly wear it in front. THe last necklace is just gorgeous. I would love to wear it every day! 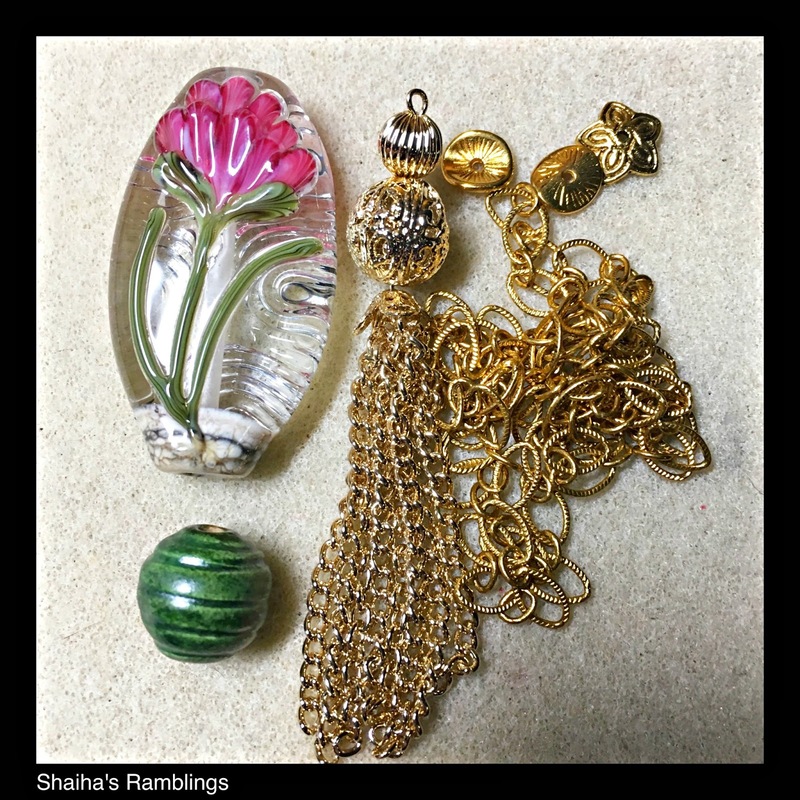 You have made so many really pretty necklaces Shaiha I love them all the colours are lovely and soft. I'm a tunic/tassel girl, too, so I loved everything you did! And I have one of those ceramic clasps -- or had. I used it on the side of a necklace, and it sold. They're so pretty, aren't they? 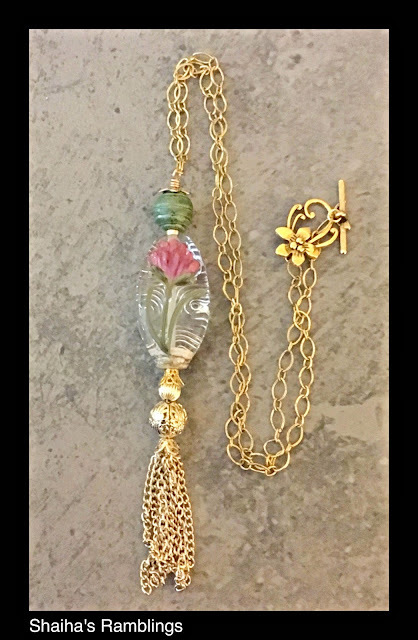 Gorgeous, gorgeous - and the texture on that focal floral bead is to die for! Well finally finished with tax season, so now I can hop. Stunning...I love the first necklace....the pendant is just gorgeous!